A stand-alone expansion for Zooloretto. 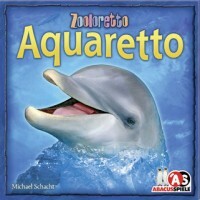 Aquaretto is continuation of the game series starting with Zooloretto by Michael Schacht. 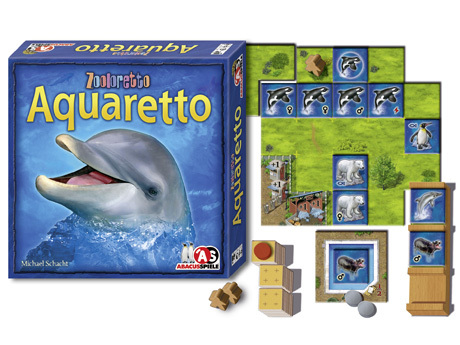 It is however a standalone game, so Zooloretto is not required to play the game. In this version, players compete against each other to build the best aquarium theme park using careful placement of their animals and coworkers. Can also be played with Zooloretto for mega zoo fun. Aquaretto borrows the same core mechanics as Zooloretto. Players will randomly draw animal tiles each turn and place them on trucks, then pick trucks, etc. See Zooloretto reviews for more info on gameplay. Where Aquaretto differs, is that it your aquarium spots have a more “tactical” feel in how you place your animals in the aquarium. There are no “pens” in Aquaretto like Zooloretto, and you can’t place animals of different types next to you each other (only on diagonal). So real estate is a premium in your aquarium area, and players really have to take in consideration how they fill up their spaces. Of course, there are options of expanding and where you place expansions which affects how you grow your park. Also, Aquaretto introduces “coworkers” into the game which provide different bonus scoring options. Players receive coworkers when they collect a certain number of animal type in their aquarium. When that number is reached, a player can choose to make their coworkers a animal trainer, cashier, keeper, or manager. The animal trainer scores points for “trainable” animals(dolphin, sea lion, or whale) next to the worker at the end of the game. The cashier activates points for the number of coins you have at the end of the game. The keeper activates bonus points for every animal with a “fish” symbol in your park. Finally, the manager is placed by the depot (like the barn of Zooloretto), and cuts the penalty in half for the animal types left in your depot at the end of the game. There are few other tweaks to the game such as animals going into the depot are now order dependent. This means only the animal on top is accessible for purchase or removal. I should also mention that coins are now gained by the amount of animal types placed in your park at different intervals. However, it still contains a potential high “screwage” factor like Zooloretto with the way you place animals on trucks and force people to pick animals they don’t want which messes up their park. Just the introduction of the coworkers alone makes this Aquaretto far more interesting then it’s older brother, Zooloretto. It adds a lot of depth to the choices you need to make on how to build your park. Do you maximize the amount of animals you take with “fish” symbols or do I sacrifice space in my aquarium for a trainer and go for trainable animals? Placement is also, such more critical now with an open-ended aquarium compared to walled-off pens. The decisions are deep enough to make the game fun and tense, yet not too overwhelming. I really enjoy this version of the series much more. There are lot of expansions that come with Zooloretto, and I think it takes more expansions to make Zooloretto as interesting as Aquaretto’s base level of play. So, I would recommend you skip Zooloretto and get Aquaretto instead. If you already have Zooloretto, I still think Aquaretto is a good addition. Plus, you can combine the two together for some grandiose play. Add a Review for "Aquaretto"